It's official. 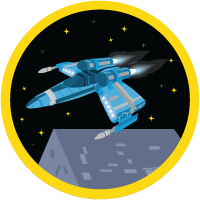 Based upon the tweets, everyone seems to love our Trailhead project, Build a Battle Station App! We are thrilled it has been received so well. The Trailhead way is to do crazy, fun stuff and the hype surrounding Star Wars was the perfect opportunity for us to do something fun for the community. We've done daily fun badges before but we wanted to do something special for Star Wars. We are all huge fans, of course. Given the buzz, I thought everyone might enjoy a little insight on how we built the project. "From across the galaxy you have just received a distress message from the planet of Onpremsia..."
"The Council of Safe Harbor begins a furious plan..."
My partner in crime Chris Duarte was awesome as usual. We met a couple of times to brainstorm ideas and anyone listening to our conversation must have thought we'd been drinking. We had soo much fun talking about different ideas and scenarios. She's such a Star Wars nerd. I spent the next couple of weeks tweaking the scenarios and building the units to walk users through the entire process of building the battle station project management app. Steps were double and triple checked and final screenshots taken. I must have build that app 10 times in total! Finally, when I was happy with the project I wrote the code that runs "under the covers" and checks that you've done everything correctly. This was a huge team effort by a number of people behind the scenes. In addition to Chris, I also have to thank Jacob Lehrbaum and Lauren Grau who kept me out of legal hot water by proofing my prose a number of times. Also, our fearless leader, Sandeep Bhanot for voluntolding me for this project. I'm glad everyone is having fun. Keep the tweets coming!